The Lost Vikings Zagara may be the only hard counter to Lost Vikings. You could be the ultimate viking hunter with Nydus Network. Take these guys down a peg. However, until you get to level 10 you may struggle a bit. Watch out for the 4 man gank squad. Murky You are the ultimate lane bully. Show them the might of the Swarm! 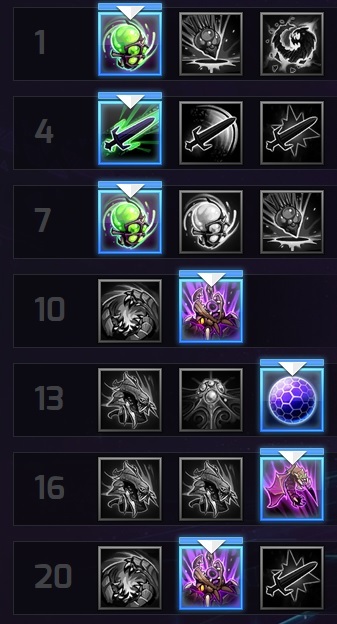 Abathur Threat level tier: average. Not bad vs you but not necessarily good vs you either. This'll mostly depend on the players. Medivh Your damage tends to be more sustained, so force of will is less effective vs you, however, good portal play could ruin your day. Don't underestimate Medivh. Kael'thas Burst damage. Scary for somebody as squishy as Zagara. But you shouldn't have to play any differently than if you were any other squishy hero. Also these guys tend to have reliable ways to clear creep and that wrecks you. Anub'arak Heroes that can dive and pressure the back line are the next biggest threat to Zag. She is squishy so if she gets focused she's in trouble. However, she should be okay if she has a tank or two to peel for her. Zagara Annoying as anything out there. Assert your Dominance. 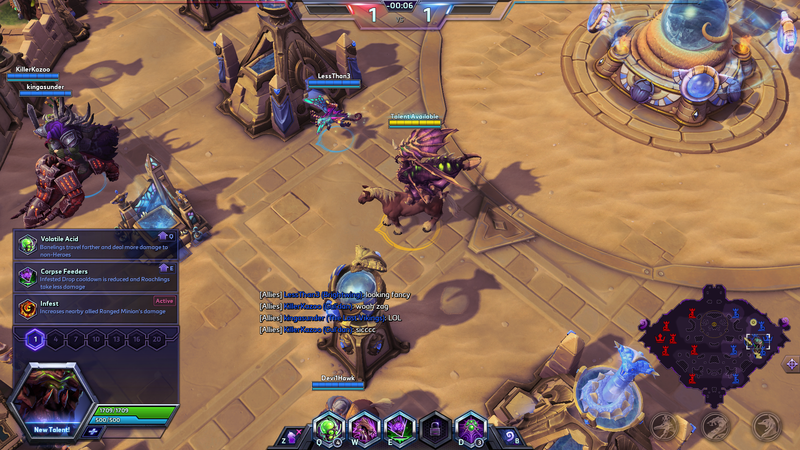 Dehaka Global heroes can deny Zagara's split push pretty well rendering her less effective. Illidan Illidan is nasty. No matter what build you go, he's dangerous for you. try and get him banned or make sure your team picks him. He'll destroy your split pushing worse than any other hero with the hunt, and can deal with you while you're doing your backline antics better than most heroes too. Zagara was my first love in Heroes of the Storm. I have her to level 19 right now and I know her strengths and weaknesses better than any other hero in the game. As of patch 19.0 she is very different. In fact, she’s almost like a new hero. And in most ways she’s a better and more versatile hero than she ever used to be. But the rework is not without a few drawbacks. I’m here to help you maximize the ways she’s improved and minimize new weaknesses. Creep has always been important to Zagara, but now it’s crucial. All her power lies in her ability to plant herself on some creep and chunk away at the enemy from far away and get various benefits from that I’ll get into. So get good at your ABCs (Always Be Creepin’). Plant creep down in the middle of a team fight so you can sit on it, creep up whatever lane you’re in. Use creep to scout locations. etc. 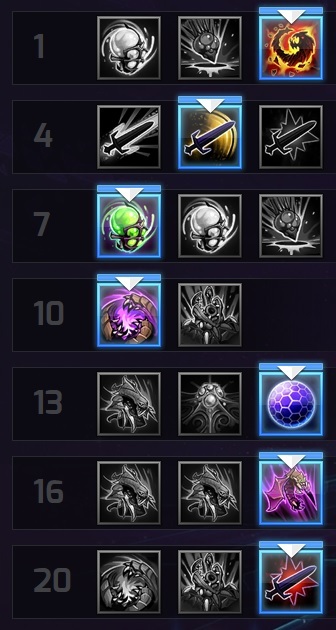 Zagara has several viable builds that I will explain below. Each one excels in a different situation. Don't be afraid to pick Zagara in most situations, she's versatile enough now that she can use one of those builds and find success. The only situations I would avoid picking Zagara is if I were up against an Illidan, who's kit seems tailor-made to destroy any build Zagara could run. Or if Zagara doesn't have a strong tank and healer to peel for her. Anything else, and you can use one of the builds below to great effect no matter your situation. Zagara's low self sustain means that in team fights she needs to avoid taking damage. Fortunately her kit allows her to hang back behind her team. She has extra aa range while on creep and her abilities have good range. Use your teammates as body shields and poke away at the enemy from a distance. Now lets get into the builds. Need to deal as much damage to buildings as possible as fast as possible so you don't get caught out. Cut and Run is then name of the game with this build. The reason you get envenomed spines is so you can use it on a tower right before you leave and let the poison continue to damage it. With the cooldown reduction at level 10 you can safely get off 8-10 banelings before the enemy responds to you. Banelings are your primary means of dealing damage. Remember that damage stops you from entering a Nydus Worm now and that you can only place them on creep. Before level 10, do some prep work and make sure you have creep on all 3 lanes. Don't get caught out. No need for a healing talent when you spend so much time in Nydus Worms. Get Spell Shield for the damage prevention, just in case. They last 60 seconds, They can potentially do a lot of damage while you are off in another lane. You won't be in a lane long enough to get use out of the other talents either. Makes Nydus Worms much easier to push with. The clear winner. Also helps with escapes for if you find yourself in a bad situation. Here’s the deal, the new Nydus Network has a lot of cool benefits, CDR, better creep usage, etc. But it has a big weakness that the old Nydus doesn’t: damage interrupts Zag from using it. What this means is that Zag has no reliable means of escaping bad situations if she gets caught out while split pushing. Before, you could just run to your Nydus as soon as you see the enemy team and be fine, but here if you see the enemy team then you’re already dead. So how to get around that? First: MAKE SURE YOU KNOW WHERE THE ENEMY IS BEFORE YOU GO KNOCKING ON THEIR DOOR. This is a good general strategy for any hero you wanna split push with but doubly important for Zag now. Second: Cut and Run. Because of that weakness Zag needs to deal her damage as fast as possible and then get out. This build allows for that. You’re going to use mostly banelings for that since you can get off 8-10 before you need to worry about bailing. That’s why we build the baneling talents. In addition to that, you’ll use roaches to soak tower hits and hydras to chunk the towers. You’ll only be able to safely get one rotation off of this though, unless the enemy team is dumb. Again, keep an eye on them on the mini map. If you don’t see 5, time to leave. So this build is all about doing a lot of damage fast and safe, and then moving onto the next lane. You’re not sitting in the lane pushing with minions because that’ll get you killed. Infest is counterproductive to this playstyle since to get value out of it you need to babysit your minions. Banelings are better for that reason. Your team fighting skills are not strong with this build. At 13 You grab spell shield because it’s generally the best option in this case (don’t need hydra healing when you spend so much time in your nydus), the other option, protective coating would be alright if they don’t have strong spellcasters though. Either way, your goal is to never deal with the enemy team past 10 anyway so the 13 talent is more of a failsafe. If you have to teamfight you’ll do alright but use one of the other builds if you plan to team fight much at all. Lowers the cooldown of Roach Drop, this ability will be one of your best damage dealers later. In conjunction with Nydus Network, you should be able to use it roughly every five seconds with this build. Serrated Spines will give you great sustained damage late game. Try and auto attack as much as you can. Leverage creep for the extended auto attack range. This quest is harder to complete than it looks, but even incomplete, it's a great boost to Zagara's damage. try and use it when the enemy team is bunched up or when somebody is cc'd. Try and lead with it, like Tyrande's stun. You can use this to split push, but mostly we get it for the CDR and the sustain it gives you. Put one behind you in team fights, if you get low on mana or health sit in it for a couple seconds and rejoin the fight. Over a sustained period of time, this will have the most value. Just stay on creep during fights. Along with your ult, this lets you have 2 Hunter Killers up all the time. Tons of sustained damage. This will improve your auto attack damage and give you more burst. Also makes waveclear a joke. Also known as the “use this build for sustained fighting” build. This build is very reliable and allows Zag to be valuable in every situation, team fighting and pushing. Zag becomes a monster in extended fights with this build and can still get a lot of use out of her nydus to push lanes and stuff. Think of this build as the middle of the road build. It makes her strong all around, but doesn’t excel in any particular area. She can split push, she can fight. The way you play this is to put a nydus worm behind your team any time you’re about to team fight. Then use your abilities as often as you can. Try and hit people with your roach drops (the burst from that gets pretty strong with this build), banes offer great poke. Hydras do their hydra thing. You’ll run out of mana pretty fast, but that’s why you have the nydus. Get in there, sit in it for like 3 secs, and get out and back into the fight. Stay on creep so you get your CDR. Your build is entirely dependent on that. That’s the purpose of your lvl 1 and 16 talents. It lets you use those abilities more often. You can have 2 hydras up all the time with the cdr from nydus past 16. You’ll be amazed at how much all this can help in a team fight. Since you’ll always be on creep in fights get protective coating (the creep talent) at 13, it’ll give you the most use over a long period of time. You should always have some of the highest hero damage in the match with this build. At 20 you aren’t split pushing with this build so get more damage with fury of the storm. This build isn’t as useful if you aren’t able to extent fights. It’s best with a comp that can sustain well. If your comp can’t do that, consider the next build. This build doesn't require any of the three level one talents, but volatile acid will help most with your wave clear so take that. This will combo with Maw really well and make the maw even more punishing. The slow will help secure the kills of those caught in the maw. If your team lacks good aoe damage however, you can trade this for Bile Drop. This Ultimate is still one of the best in the game. Catching 2 or 3 enemies in a maw is a game changer, any more than that and you've basically won already. 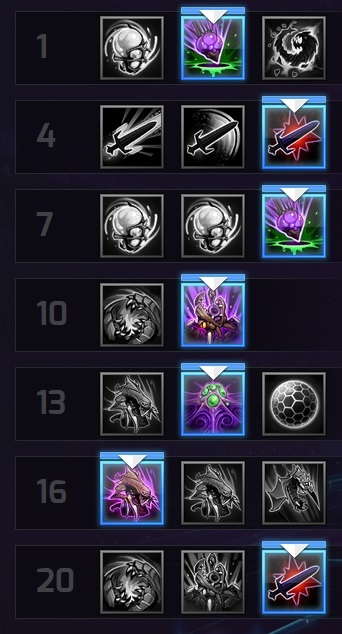 This build doesn't have any reliable ways to sustain Zagara like the others. Hydralisk Transfusion helps fix that, note that it only works if you use it on heroes. If you're getting bursted down fast, consider one of the other options. Mutalisk will probably be the more common choice, but Corrosive Saliva will be good vs a double warrior comp. Muta combos better with Hydralisk Transfusion because they last longer. Muta has the added benefit of forcing your enemy to deal with it or take a lot of damage. Also known as the “use this build if your team can end fights fast” build. This is the maw build. Maw is still a hell of an ult, so we’re building around your ability to get maws off and capitalize on that. Don’t waste your banelings until you get your maw off. You need to make sure you have 4 charges to shoot into your maw once it goes off. Until then, poke with a single baneling and never use the extra charges. The maw combo as follows: maw, then send 4 banelings and a roach pod into the center of the maw. If timed right you should get a lot of aoe burst on everybody caught in the maw. Your banelings will slow the enemy team too so you get a nice stasis into slow on the enemy team. It’ll be hard for them to survive that. If you need more aoe damage, trade Vicsious Acid (slowing banelings) for Bile drop at 7, but I think you’ll find the slowing banelings more useful in most cases and can help secure kills after the maw hits since the enemy team will be slowed as they try to run away, or try and chase you. It can also help you land maws. Percent based attacks like corrosive saliva don't actually combo with life steal abilities like hydralisk transfusion. For that reason, I'd say that level 16 can be a flex/preference pick. Usually you'd take mutalisk, but corrosive saliva, like any giant killer ability, would be really good vs double warrior comps. 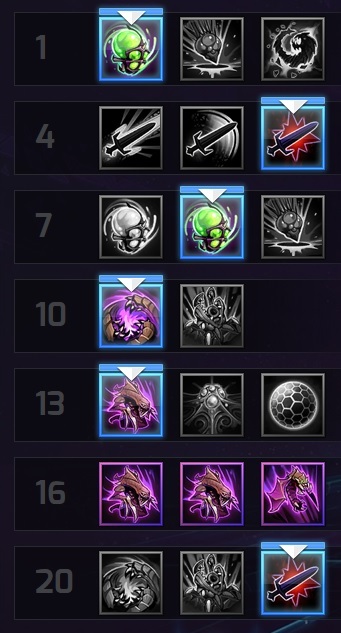 And unless you're getting burst down real fast, I'd still take hydralisk transfusion at 13 since Zag doesn't have any self sustain with this build otherwise. At 20 Tyrant Maw wasn’t good before the rework, won’t be good now. Fury of the Storm will give you some nice burst damage on your aa in combination with your lvl 4 talant anyway so take that one. This build will not net Zag as much hero damage as the other build, but hopefully you won’t need it. Maw is a playmaker and we’re going to help it make more plays. This build also doesn't allow you to split push and Zagara's sustain is really lacking with it. If you don't have good heals and a good tank to peel, it might be better to take the less risky CDR build. “But what about infest?” you ask, “I wanna use it! It’s a cool talent!” Look, it’s a cool talent on paper, but there are very few situations that will make it worth getting. I think it may be viable on Tomb of the Spider Queen. But none of the other maps. The other builds are simply much better and safer. Even on tomb, I’d rather use any of the above 3 builds. BUT if you are determined to make it work, I’ve made a build for you, too. Something to keep in mind is that infest only affects archer minions so you can’t just get it and say, “this'll be useful when catas come out” like you could with the old infest. To get value out of Infest, you need to babysit minion. stay in a lane as much as you can. But be careful about overextending. Always keep an eye out for enemy rotations. Since you're not going to spend as much time team fighting, you'll get the most value out of medusa blades. it gives her nice siege damage, which in turn empowers Infest. More siege damage than the other options. Siege damage empowers Infest. Get maw because otherwise you have no escapes. Remember you can't use nydus to escape bad situations anymore. Use it to stop ganks and run away. Be careful because it's a 100 second cooldown. You could use it in team fights too, but don't let yourself die for the possibility of using it later. This gives you some more survivability in the event you get ganked. You'll get most value out of the long life Mutalisks in this build. More siege damage. You’re building to rack up the siege damage and buff your minions. This is the optimal build for that. But why not nydus? Because you are babysitting minions, you don’t care about jumping from place to place. And maw is your best chance at escaping when you find yourself out of position. Cast it behind you as you run away and try to catch the ganking heroes inside it. That’ll give you enough time to mount up and run, assuming you don’t miss the maw. Of course maw is a huge cooldown so good luck if you try going to lane right away again. Definately not on any map other than Tomb of the Spider Queen where you spend so much of the game pushing lanes anyway. Even then, I really believe a build centered around infest will not work as well as anything else. Zag is squishy and has little in the way of escapes, so a focus on siege damage and babysitting minions will likely only end in her death… many many deaths. So there you have it. Zagara is a very interesting hero now. Less forgiving, but with more options and variety. She's useful in most any comp, and she can really punish an unprepared team. Plus she can ride a horse now. So if the above didn't sell you on her this surely will.